Along with the monster Dendrobium nobile featured yesterday we have this wonderful oversized Vanda on its way to London this morning too. 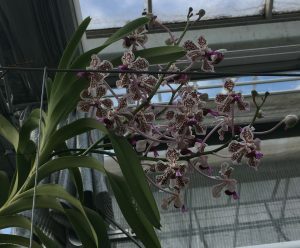 The plant is now around 2m tall with four large flower spikes of beautiful flowers. 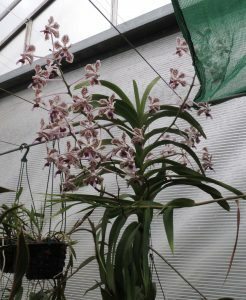 The flowers are also very fragrant. This grand orchid is native to lowland forest in Java and is clearly determined to become a giant orchid over time. The plant produces stiff alternate leaves 30cm long. The plant is loving life in Warm Asia and has two new growths coming near the base an so will become a multi-stemmed plant over time. 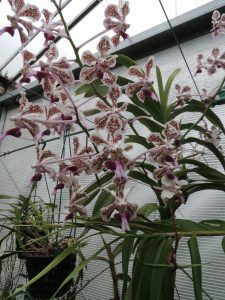 Sometimes this plant is listed as a the species Vanda suavis, separate from the other form of Vanda tricolor (also found in Java) which has fewer, rounder flowers, but we will follow theplantlist.org in our labelling.